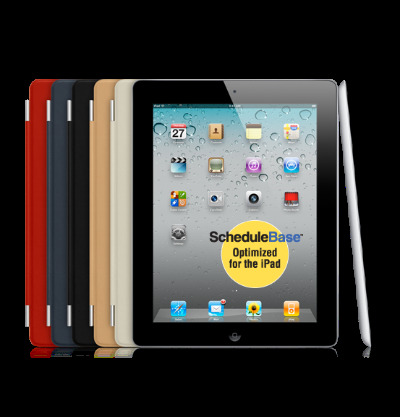 Tell a friend about ScheduleBase and you could win an iPad! Online employee scheduling made easy. Tell a friend and Win an iPad Contest! Being a fan of ScheduleBase has its rewards – like getting a chance to win an iPad just for spreading the word to your friends or colleagues. In fact, for every friend you tell about ScheduleBase, you’ll receive a chance to win.1 There’s no limit to the number of times you can enter so be sure to tell all your friends! 1No purchase is necessary to enter or win. Must be a legal resident of the United States and its territories and, as of the entry date, 18 years of age or older and have lawful access to the Internet and a valid email address. Contest ends on December 31, 2013. One (1) winner will be picked at random and notified via email no later than January 7, 2014. If the winner fails to respond to the winning email notice by January 31, 2014, no prize will be awarded, and no alternate winner will be selected. The qualified winner will receive an Apple iPad with a retail value of $499. This prize does not include service activation or accessories. Winner is responsible for all service activation pertaining to prize and any other fees, charges or equipment required to use the prize. Atlas Business Solutions reserves the right to substitute a prize of equal or greater value at its sole discretion. This offer is subject to change without notice. Other terms and conditions may apply. Void where prohibited. iPad is a registered trademark of Apple Inc.